They look like they're from a James Bond movie, and they're gaining popularity at local beach destinations. 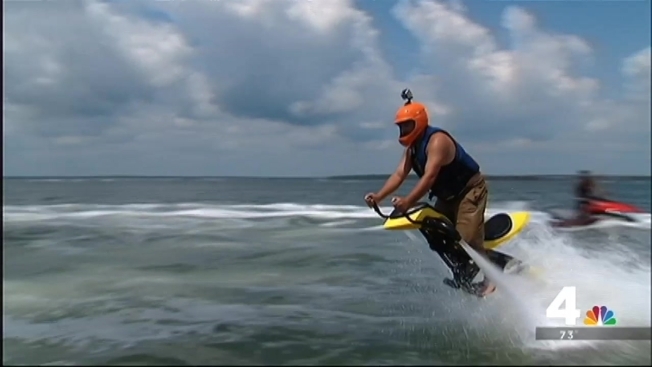 Now, Maryland is becoming one of the first states in our region to regulate jetpack vessels. Jetpacks can thrust you as high as 30 feet in the air and back into the water. That kind of action, and the safety hazards it can bring, caught the eye of Maryland's Department of Natural Resources (DNR). "They can get in close to restaurants and zip right up into canals, and that's where the safety concerns come in for us," DNR Police Boating Safety Coordinator Julie Brown told the I-Team on a visit to Ocean City, where three vendors currently rent out jetpacks. Maryland put a new set of temporary emergency regulations regarding jetpacks into place this summer, making it the first state along the Mid-Atlantic to do so. Those regulations mean riders have to wear helmets and stay 100 feet away from bridges, buildings, shores and other structures, among other rules. The relatively shallow depth of Ocean City's back bays also pose risks that make a jetpack's capabilities to shoot a rider under the water, potentially straight into the sand, a concern, Brown said. "When you go in the air and you intentionally try to make yourself go underwater forcibly, that is against the regulation," Brown said. "You come up, you come down, then all bets are off." Some communities are even stricter. Deep Creek Lake has restrictions on where and even what time of day you can use jetpacks. The I-Team found other states in the region have proposed specific regulations for jetpack use. But for now, in New Jersey, Delaware, Virginia, D.C. and North Carolina, the vessels fall under current rules for jet skis and other personal watercraft. Even though Justin Wood runs Chesapeake Flyboarding out of Fenwick Island, Delaware, he sticks to Maryland rules since his customers fly over Maryland waters. "I think it's a good thing," Wood said of the state's regulations on jetpacks. "Nobody should have these things just running around." Sean Crosariol at OC Jetovator said he's also glad Maryland dropped the minimum age requirement to ride from 16 to 14 years old. The company requires parental consent for younger riders and stresses that a trained professional is always in control of the jet skis that power their rides. "If we see you're going too close to a bridge or too close to other boat traffic, we're always going to stop, reset and explain to you why we put you down," Crosariol said. The I-Team found no serious accidents reported from jetpack use in Maryland. Officials and vendors hope the rules they've worked on together will help keep it that way. "You want people to have a good experience and come back year after year," Crosariol said. "You don't want to hurt anybody." DNR says it expects its temporary jetpack regulations to become permanent as early as this fall. You can read more on the regulations here.